At Shepherdsville Chiropractic, we complete a thorough exam before developing a treatment plan that can help you. If we don’t feel chiropractic care will benefit you, we’ll recommend someone who may be able to help instead. Here, we treat our patients like family – we truly care about your health! Care is completely safe for family members of all ages and gentle enough for those who’ve been injured in auto accidents. 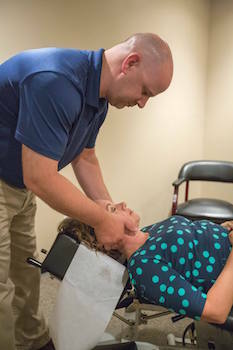 For patients who may be new to care and prefer a more reserved approach instead of “popping” adjustments, Dr. Dahlkamp can incorporate a combination of diversified technique with activator method known as “Diversivator”, which allows for the use of an instrument to gently adjust your spine without any “popping” sound. If we think it will help you, we’ll also incorporate other modalities including electrical stimulation to relax tense muscles and improve circulation and intersegmental traction to gently stretch the spine. After a chiropractic adjustment, patients will likely feel looser, more relaxed, less tense, more mobile and may even be more flexible. It’s important to remember that each adjustment builds upon the last, slowly and steadily improving the function of your spine until we get it back to where it needs to be. You don’t have to live in pain! Contact our office today to schedule your first exam and adjustment with Dr. Dahlkamp. We have ample parking, accept most major insurances and will even file for you. We can’t wait to meet you!